We shall continue with modeling the Issue Purchase Order View. In the previous stage, we modeled the relationship between a purchase order and a requisition. Specifically the modeling is of a one-to-many relationship, where multiple purchase orders may be related to the same requisition, each containing some of the requested items. A purchase order (PO) list appearing under the requisition list. Whenever a requisition is selected in the requisition list, the PO list is updated with the POs linked to the selected requisition. Calculate PO Count and Total Price for each requisition, counting the number of POs linked to each requisition, and calculating their total price. This stage’s modeling should be performed in the Tutorial 13-14 project, you imported at the end of the previous stage. Our first task is to create a process that updates the purchase order list when a requisition is clicked in the requisition list. Zoom to Approved Requisitions List/Row. Add a Basic/Action. Name it <On Click>. Alternatively, you can add the <On Click> process, by opening (through right-click) the Row element's context menu and selecting it from the Add Element sub-menu. This is another example of a situation where a table display cannot be based on the Simple Table template – since the <On Click> process is part of the Row display element, while a Simple Table contains just a data structure. Add ancestor reference of Row. Add a Basic/Action. Name it Display Purchase Orders for Requisition. Add a trigger to it, and create a flow linking Requisition Row/Id/<Value> to the trigger. Zoom into Display Purchase Orders for Requisition. Add a trigger to it. Name it Requisition Id. 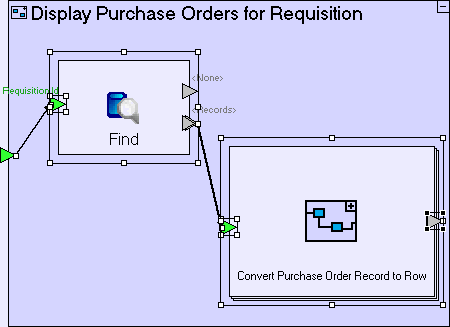 Create a flow linking the trigger of Display Purchase Orders for Requisition to it. Add a Basic/Action. Name it Convert Purchase Order Record to Row. Mark it repetitive. Add to it a trigger and an exit. Create a flow linking Find/<Records> to the trigger. Zoom into Convert Purchase Order Record to Row. Drag a Purchase Order data structure from the repository/outline (it's available in Order button/Create Purchase Order popup/ Submit Order button). 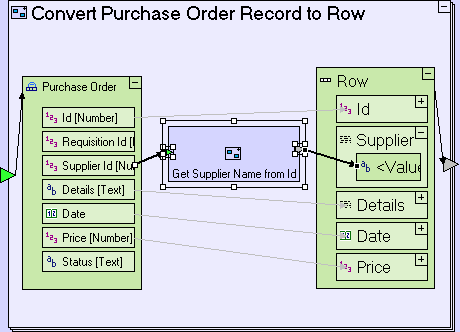 Add a flow linking the trigger of Convert Purchase Order Record to Row to the data structure. Drag Purchase Order List/Row from the repository/outline (to create a display data element). Add a flow linking it to the exit of Convert Purchase Order Record to Row. Add a Basic/Action. 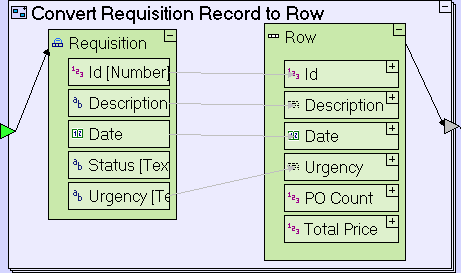 Place it in between the Purchase Order database record and the Row display data element. Name it Get Supplier Name from Id. Add to it a trigger and an exit. Create a flow linking Purchase Order/Supplier Id to the trigger of Get Supplier Name from Id. Create a flow linking the exit of Get Supplier Name from Id to Row/Supplier/<Value>. Zoom into Get Supplier Name from Id. Add a Database/Find. Add to it a trigger and name it Id. Create a flow linking the trigger of Get Supplier Name from Id to Find/Id. Drag a Supplier database record (it's available in Manage Suppliers view/Supplier List table, among other locations) into Get Supplier Name from Id. Create a flow linking Find/<Records> to Supplier. Note that although the <Records> exit is a repetitive exit, it is linked to a non-repetitive target data structure. This is not a problem because we’re using Id as the retrieval criteria for the Find process, and since Id is unique, the process will never return more than one record. Create a flow linking Supplier/Company Name to the exit of Get Supplier Name from Id. You've probably noticed that the Find element we've just added, appear slightly different than usual, displaying 2 names: Find [Find 2]. Find, is the Element Name. Find 2, appearing in square brackets, is the Model Name. As explained previously (See Stage 2), elements have both a Model Name and Element Name defined automatically – but since they are usually identical, they are usually displayed as one. When adding an element to the model, the Tersus Studio will automatically modify either of the names in order to maintain uniqueness, by adding an index number, in cases where the name provided by the user is already in use. In the current scenario, the Find element in Get Supplier Name from Id is stored (by default) in the Approved Requisitions List package (check this by right-clicking Find in the model editor and selecting Show in Repository Explorer). This package already contained a model called Find (the one we created in Display Purchase Orders for Requisition just beforehand), and so the newer Find must have a different Model Name. Zoom out to Display Purchase Orders for Requisition. Create a flow linking the Convert Purchase Order Record to Row exit to Issue Purchase Orders/Purchase Order List/Row. 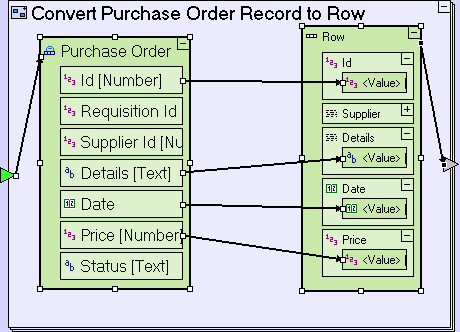 Note that we are now using a different method to populate a table with rows (compared to the various Populate… processes we modeled in previous stages): Instead of sending the rows to an intermediate Purchase Order List data element which is then sent to the display ancestor reference, the rows are sent directly to the display. 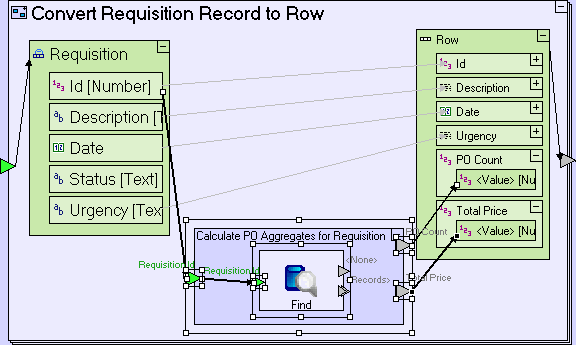 The model is simpler then previously modeled Populate… processes, but has one behavioral difference which needs to be addressed: Since the display is now updated at the row level and not at the table display level, the rows are accumulated by the repetitive row element, meaning that if rows were displayed in the table before the process was executed, the new rows created by the process will be added to the existing rows, instead of replacing them. Create a Remove flow, linking the trigger of Display Purchase Orders for Requisition to Issue Purchase Order/Purchase Order List/Row. You might think that we could have set the source of the remove flow from the Find/<None> exit (as we did in the various Generate ... models previous modeled), but that would actually be the wrong thing to do, since it would only clear the table in those cases where Find did not locate any purchase orders, and so will not clear the table when records are found, causing duplicates to appear. Setting the remove source as we did, ensures that clearing the table occurs regardless of Find's result, and actually before Find is executed. Zoom to Issue Purchase Orders/Populate Approved Requisitions List/Generate Approved Requisitions List/Convert Requisition Record to Row. Add a Basic/Action template. Name it Calculate PO Aggregates for Requisition. Add a trigger to the process. Name it Requisition Id. Create a flow linking Requisition/Id to it. Add an exit to the process. Name it PO Count. Create a flow linking it to Requisition Row/PO Count/<Value>. Add a second exit to the process. Name it Total Price. Create a flow linking it to Requisition Row/Total Price/<Value>. Zoom into Calculate PO Aggregates for Requisition. Add a Database/Find template. Add a trigger, named Requisition Id. Create a flow linking the Calculate PO Aggregates for Requisition/Requisition Id trigger to it. Counting the number of returned Purchase Order records – this is the PO Count. Summing the Price of each returned Purchase Order record – this is Total Price. Add a Collections/Count ( ). Delete the unnamed non-repetitive trigger, leaving the repetitive List trigger intact. Create a flow linking Find/<Records> to Count/List. Create a flow linking Count/<Occurrences> to the Calculate PO Aggregates for Requisition/PO Count exit. Count does just that; it counts all objects sent to it, and when no more objects are sent, it outputs the object count. Note that Collections/Count has a similar icon to Database/Sequence Number - make sure you do not mix them up. Drag a Purchase Order data structure from the repository/outline. Set it repetitive. Create a flow linking Find/<Records> to it. We shall use the Sum template to calculate the total price for the requisition. Add a Math/Sum ( ). 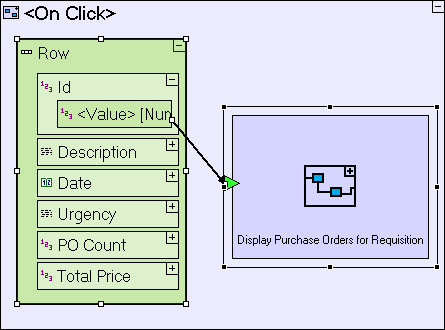 Create a flow linking Purchase Order/Price to Sum/Numbers. Create a flow linking Sum/<Sum> to Calculate PO Aggregates for Requisition/Total Price. When the Issue Purchase Orders view is opened, and the Approved Requisitions List table is populated, the aggregates are shown correctly. However, when a new order is issued, the display (including the aggregates) is not updated. In previous stages we've reused the Populate... process to update the table, and although we could do the same here, that will not be sufficient, since it does not clear the table (although that could be fixed). There's also the issue of the Purchase Order List table, which should be cleared since no requisition is selected. Zoom to Submit Order button. Add a Basic/Action. Name it Refresh Issue Purchase Orders View. Add a Control trigger and a <Done> exit to it (using the Add Element context sub-menu). Select the flow linking the Handle Database/<Done> exit to the Close Window/Control trigger, and drag the target to the Refresh Issue Purchase Orders View/Control trigger. 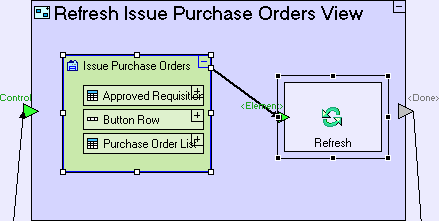 Create flow linking the Refresh Issue Purchase Orders View/<Done> exit to the Close Window/Control trigger. Zoom into Refresh Issue Purchase Orders View. Add a Display Actions/Refresh ( ). The Refresh action reloads the display element passed to it, clearing the display element in question and executing any processes it contains – this is identical to the behavior when the element is loaded in the first place. Import the sample project Requisition Management System. If you installed the Tersus Studio using the installer, there is no need to import the project and it should be available in your workspace. If you do need to import the project, see the Importing a Sample Project section at the end of Stage 2. This project contains all the functionality modeled thus far plus additional functionality required to complete the application. Updates the status of the selected purchase order to Received. If the requisition to which the purchase order belongs has additional purchase orders not yet received, then it changes the status of the requisition to Partly Fulfilled. Otherwise, the status of the requisition is changed to Fulfilled. Refreshes the display of purchase orders.